What is Credit Card Processing and How Does it Work? In this guide, we walk you through everything you need to know about credit card processing — and how to select the best option for your business. It helps to know the ins and outs of credit card processing if you’re thinking of starting a business or you own one already. In this guide, we walk you through everything you need to know about credit card processing — and how to select the best option for your business. 1. What is a credit card processing company? A credit card processing company (like Square) handles credit and debit card transactions for businesses. 2. How does credit card processing work? Credit card processing works through several parties. These include issuing banks, acquiring banks and the merchant services provider. 3. How much are credit card processing fees? 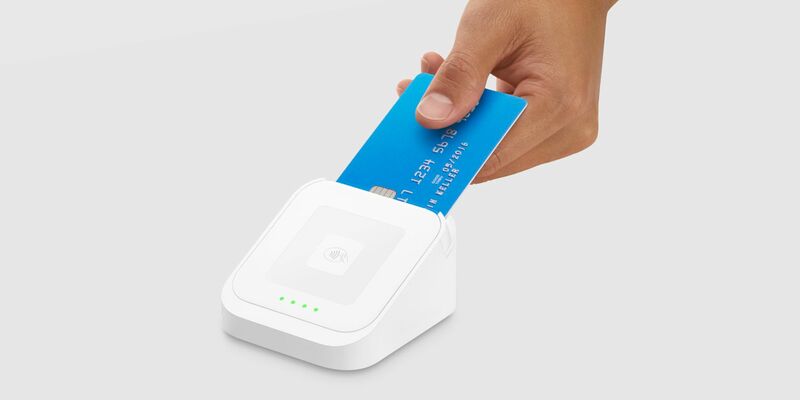 Square’s pricing is simple: 1.75% for chip + PIN card transactions and contactless (NFC) payments. The fee for manually-entered and online transactions is 2.5%. 4. How can I accept credit card payments? 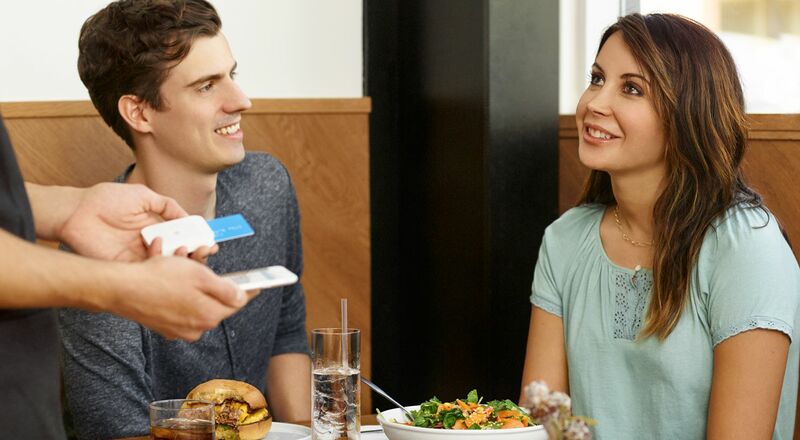 To accept credit card payments, you need a credit card reader. The Square Reader is just £39 (+ VAT), and accepts chip + PIN, contactless and mobile payments. It also comes with a mini Square Reader for magnetic stripe cards, which plugs into your smartphone. Taking a credit card payment may seem simple enough: a customer hands their card, you process it and with Square, the money lands in your account the next business day. But under the hood, there’s a lot more going on. From the moment you tap, insert or swipe the card to the moment the money is deposited, there are a number of different parties involved — each of them handling a crucial step in the chain of events. Knowing how this all works helps you understand where you might incur fees, and informs your decision when you choose a credit card processing system for your business. What is an issuing bank? The issuing bank is the financial institution that provides you with your credit card and accompanying line of credit. It’s basically your credit card company. Issuing banks act as middlemen between you and the credit card networks by issuing contracts with cardholders for the terms of the repayment of transactions. For example, your issuing bank could be Barclays. What is an acquiring bank? The acquiring bank (also known as a merchant bank or acquirer) is the bank that sends the transactions to the network, which then passes it on to the issuing bank. What is a merchant services provider? A merchant services provider is an entity that allows businesses to accept payments by credit card, debit card and also NFC mobile wallets (like Apple Pay, Samsung Pay and Android Pay). A merchant services account is established with an organisation that has relationships with the issuing and acquiring banks. Your merchant services provider allows the processing of electronic payments when your customers want to pay for things. What is a payments gateway? If your local café has an online store to sell things like coffee beans and mugs, a payments gateway would be involved in processing those online credit card transactions. A payments gateway facilitates the transfer of information between a payment portal (like an e-commerce website) and the acquiring bank. It encrypts sensitive information like card numbers to make sure everything is secure throughout the process. How do you get a merchant services account? Conventionally, if you wanted to start processing credit cards, you’d apply for a merchant services account at a bank, which can be a cumbersome process. 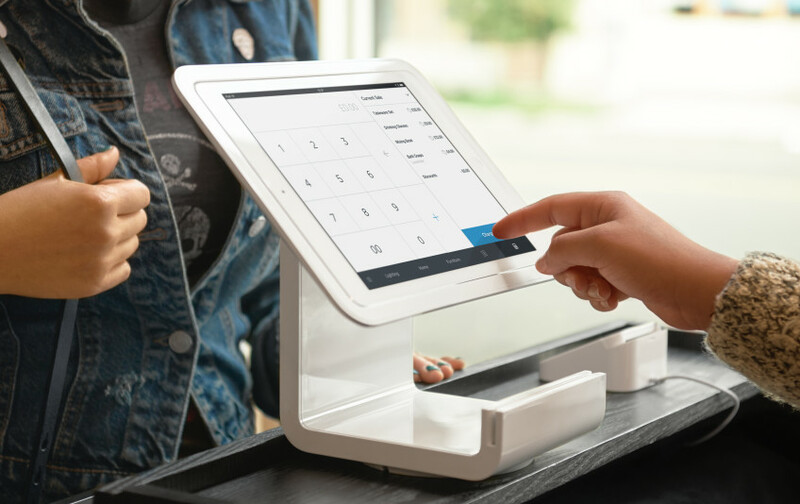 After you were approved, you would then associate your point-of-sale system with your merchant account and could start accepting credit cards. But with Square, things work differently. Square itself has a merchant services account with acquiring banks. We essentially act as one giant merchant services account for all businesses that use Square. What is a high-risk merchant services account? In the credit card processing world, some types of businesses may be considered ‘high risk’. High-risk merchant services accounts can have steeper fees and stricter terms. Institutions may also deny high-risk merchants an account. There’s no hard rule, but certain types of businesses tend to be flagged as high-risk merchants more than others. These can include businesses that sell goods or services like membership clubs, credit counselling or repair services and businesses that engage in questionable marketing tactics. Read Square’s user agreement and terms of service for more information. Now that we’ve gone through all the parties involved in credit card processing, we’ll walk through how everything actually works. Let’s go back to your local café. You hand the barista your card and she processes it. What happens next? When a merchant taps, inserts or swipes a customer’s card, the request is submitted to Square. We then send the transaction to the acquiring bank, which then sends it to the issuing bank for authorisation. The issuing bank is checking for sufficient funds. It is also running the transaction through fraud models to determine if the transaction is safe (to protect the cardholder and the issuing bank). This is the settlement stage, i.e. how the money from a transaction is sent to the acquirer to begin the process of depositing it into the merchant’s account. It’s called batching because payments are sent in a large group. The funding (or settlement) step is when businesses get the money from a credit card sale deposited into their account. Square’s deposit schedule will usually deposit the money into your bank account the next business day. Many companies have a ton of hidden credit card processing fees. These can include transactional fees (like interchange reimbursement fees and assessments), flat fees (like PCI fees, annual fees, early termination fees and monthly minimum fees) and incidental fees (like chargebacks or verification services). Square, on the other hand, has none of these. Choose your credit card processing solution carefully, as some companies can also have hidden fees. Square’s pricing is simple, so you always know what you’re getting. It’s just 1.75% for chip + PIN transactions, and contactless (NFC) payments. The fee for manually entered or online transactions is 2.5%. These fees apply to all business types, including nonprofit organisations. What’s more, Square offers chargeback protection for businesses. Square Chargeback Protection ensures businesses aren’t liable for payment disputes or chargebacks up to a total of £250 a month — and it’s free for all sellers. What is a credit card machine? A credit card machine, aka a point-of-sale (POS), is a device that interfaces with payment cards to make electronic fund transfers. Newer point-of-sale systems like Square’s also accept mobile NFC payments like Apple Pay, Android Pay and Samsung Pay. Some credit card machines can cost hundreds of pounds. Square Reader, on the other hand, costs just £39 (+ VAT) and our POS software comes free. 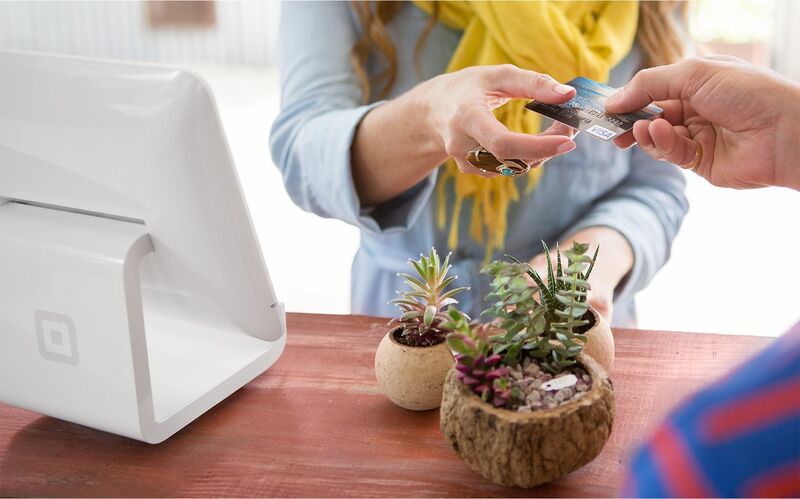 Many point-of-sale systems are big and clunky, but Square’s products are light, sleek and completely mobile. They’re designed to look great on the countertop at your bricks-and-mortar shop, and they can fit in your pocket if you’re selling on-the-go. If you’re new to all this, or you’re just starting your first business, don’t fret about getting set up to process credit card payments. Nowadays, with companies like Square, it’s very easy to start accepting credit cards at your small business. In fact, all you need is your iPad or smartphone. Square works directly with the device you already have to accept credit card payments and, with our new reader, NFC payments like Apple Pay. Order the Square Reader and tell us where to deliver it. Create your free Square account. Download the free Square app and link your bank account for fast deposits. Connect the reader to your smartphone or iPad and start taking payments. Credit cards are processed differently based on the type of card. If you’re selling from a store, you’ll most usually be taking chip + PIN (with the card inserted vertically into Square Reader throughout the transaction) and contactless payments (where the card is tapped to the Reader, completing the transaction in seconds). What other types of payments should you accept? The more payment choices you give your customers, the more reasons they have to make a purchase. If you operate from a physical location, you should definitely have the ability to process chip + PIN, contactless and mobile payments. If you work remotely, you can get set up with software like Square Virtual Terminal to take ‘card not present’ payments. In this instance, you manually type the cardholder’s details in — meaning you can take payments wherever you are. Whichever you end up using most, it really pays to accept as many different types of payment card as possible. Accept every way your customers want to pay. Take chip cards, Apple Pay, and Google Pay anywhere and never miss a sale again.